The July State Employment and Unemployment report, released today by the Bureau of Labor Statistics, was remarkable only for its consistency: most states added jobs at the same decent pace that has become the norm over the past few years—strong enough to not cause alarm, but too weak to quickly drive down unemployment. In fact, job growth nationwide was strikingly similar to the same period last year, although there have been some regional shifts. Falling energy prices continue to slow job growth in the energy-intensive states in the interior of the map, while stronger growth in construction, healthcare, and leisure and hospitality is driving relatively stronger job gains closer to the coasts. As of July, 37 states and the District of Columbia have reached their December 2007 employment totals, but only 13 have reached their pre-recession unemployment rates. From April to July, 39 states and the District of Columbia added jobs, with Nevada (+1.2 percent), New York (+1.0 percent), Rhode Island (+1.0 percent), and Utah (+1.0 percent) posting the largest percentage gains. Over the same period, 11 states lost jobs, with West Virginia (-1.8 percent), North Dakota (-1.6 percent), and Alaska (-1.0 percent) experiencing the largest percentage declines. Over the past year, the Pacific (+3.1 percent), Mountain (+2.4 percent), and South Atlantic (+2.4 percent) census divisions have significantly outpaced the U.S. average of 2.1 percent job growth, while the slowest growth has been in the West North Central division (+1.0 percent). Unemployment rates fell in 23 states and the District of Columbia from April to July, with Connecticut (-0.8 ppts), the District of Columbia (-0.7 ppts), and Indiana (-0.7 ppts) experiencing the steepest declines. 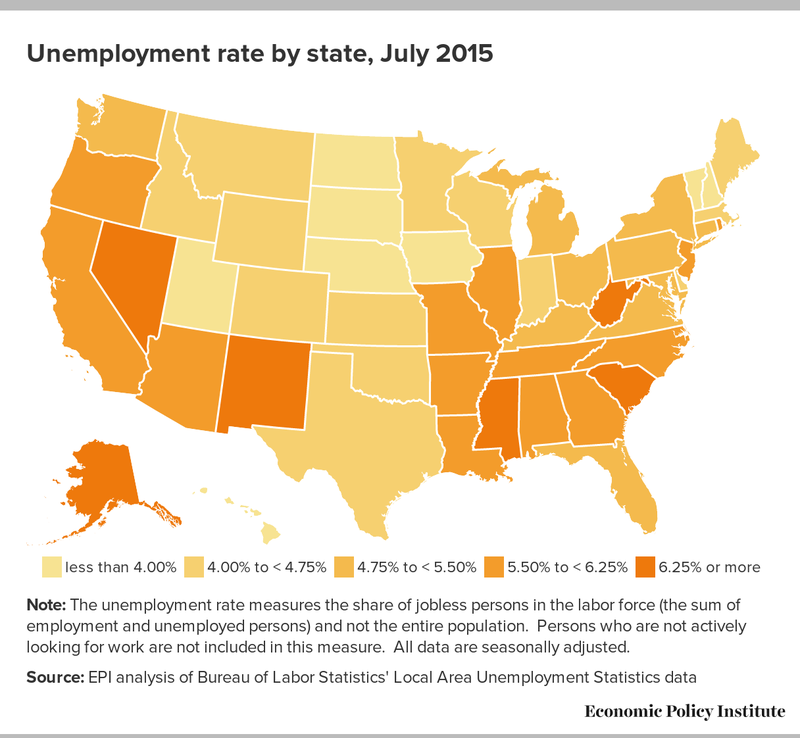 Over the same period, unemployment rose in 19 states and remained unchanged in 8 states. The largest increases in unemployment were in Oregon (+0.7 ppts), West Virginia (+0.5 ppts), Oklahoma (+0.4 ppts), North Carolina (+0.4 ppts), and Alabama (+0.4 ppts). 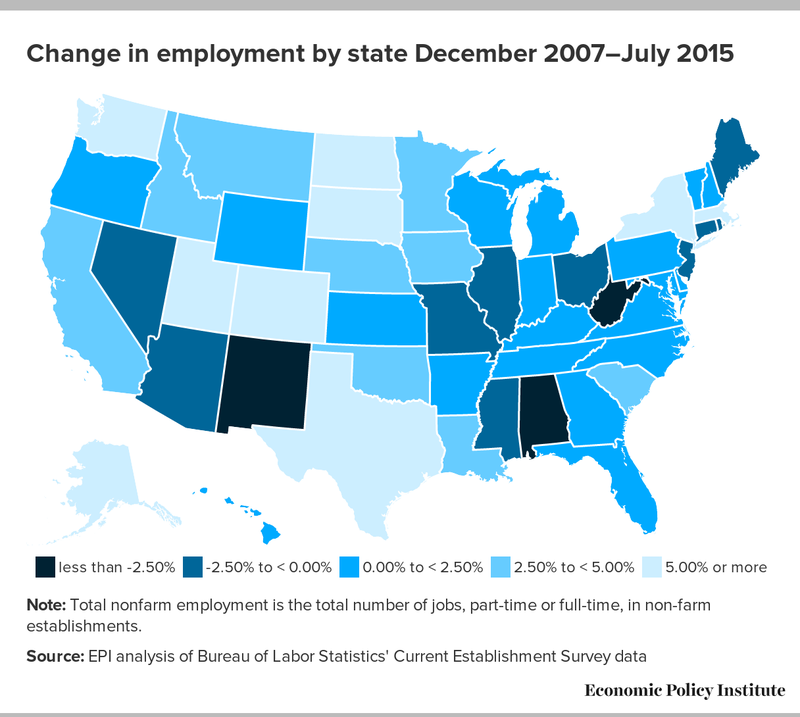 The fact that most states have been adding jobs at a steady pace for several years is unquestionably a good thing. But every important labor market indicator—the prime-age employment-to-population ratio, the hires, quits, and layoff rates, the U6 unemployment rate that includes both the unemployed and underemployed, and importantly, the growth rate of nominal wages—indicates that the U.S. economy has still not yet fully healed from the recession. Consequently, the Federal Reserve should refrain from raising interest rates and slowing down the economy until there is ample work for job-seekers in every state.